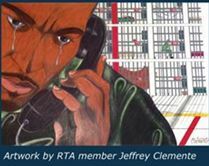 Artwork created by men and women while incarcerated in New York State prisons are featured in an exhibit presented by Rehabilitation Through the Arts (RTA). Exhibition dates: June 30 – July 27, 2018. A reception will be held Saturday, July 14, from 3 to 5pm. Guests will be able to meet and speak with formerly incarcerated artists who are graduates of RTA art courses. All the artwork will be available for sale, with proceeds going toward the purchase of art supplies for RTA prison art programs. To learn more about Rehabilitation Through The Arts, visit their website. This exhibition is made possible with support from the Ossining Arts Council, the Sing Sing Prison Museum, and the Ossining Public Library. The Heart Gallery is a traveling photographic and audio exhibit created to find forever families for children in foster care. The Heart Gallery of America is a collaborative project of over 80 Heart Galleries across the United States designed to increase the number of adoptive families for children needing homes in our communities. The exhibition at the Ossining Public Library features children living in fosters families in Westchester County. For more information about Heart Gallery, visit Heart Gallery of America.